2017 Laurent Herlin, Method Ancestral “Cintre” Rosé of Cabernet Franc, Loire Valley Sparkling Wine, France. New to America, the Herlin wines from the Loire are all natural bottlings that mostly are Cabernet Franc based from in and around the classic area of Bourgueil with it’s mix of sand, gravel, Silicieous Clay, Limestone and Tuffeau soils, they work all organic and without any chemical additions either in the vines or in the cellar. Laurent Herlin has been working without any chemical inputs since 2009, and has gone the natural wine route making clean, focused and dry versions of highly quaffable wines. Recently picked up and imported to the West Coast by long time natural wine specialist and natural wine evangelist Nadia Dmytriw at Floraison Selections, her company that hand picks a great group of top French natural wine producers, that includes Pierre Gonon in the Northern Rhone, Domaine d’Ourea of Vacqueyras, Domaine Serol of Cote Roannaise, Chateau des Rontets of Pouilly-Fuisse (Burgundy) as well as an awesome set from the Loire Valley like the famous Domaine de L’Ecu, Sylvain Dittiere, Vincent Gaudry as well Laurent Herlin. The 2017 Pétillant Naturel style sparkling Cabernet Franc Rosé “Cintre” is a vividly dry bubbly crafted completely method ancestral with absolute 0 RS (residual sugar) and low natural alcohol with almost no sulfur, except what happens in the process itself, making for a stingingly brisk and expensive Rose sparkler. The fresh and crystal clear palate is minerally and citrusy, but opens to reveal a layer of sophistication and stylish notes with hints of tart cherry, a wisp of strawberry, rosewater, bitter melon, herbs and a hint of light brioche. Ripe enough as to not has any greeness, but still with electric laced acidity, this Laurent Herlin Cintre is a lovely and fun refreshing version of a Loire Valley favorite with a bit of elegance and grace, with is not always the case with the foamy mousse Pet-Nats. This would be great anytime and anywhere, super as an aperitif or with brunch, it stand up to most dishes and would be awesome for picnics and beach parties. 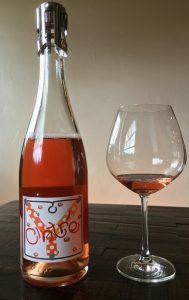 This bone dry Cintre Rosé bubbles is tasty, drinking wonderfully right now, I will have to stock up for warm Spring days, and I suggest searching out this exciting producer, I am looking forward to exploring more of his wines, especially his classic Bourgueil offering, as well as his Glou Glou Carbonic Cab Franc too.